"Lee Wiley was an American jazz singer popular in the 1930's, ‘40s and ‘50s. She possessed an attractive, slightly husky tone and delivered lyrics with warmth and intimacy. While still in her early teens, Wiley left home to begin a career singing with the Leo Reisman band. She also sang with Paul Whiteman and later, the Casa Loma Orchestra. A collaboration with composer Victor Young resulted in several songs for which Wiley wrote the lyrics, including "Got The South In My Soul" and "Anytime, Anyday, Anywhere", the latter becoming an R&B hit in the 1950s. In 1939, Wiley made a 78 album set of eight Gershwin songs with a small group for Liberty Music Shop. The set sold well and was followed by 78 album sets dedicated to Cole Porter (1940) and Richard Rodgers & Lorenz Hart (1940 and 1954), Harold Arlen (1943), and Vincent Youmans and Irving Berlin (1951). The players on these recordings included such musicians as Bunny Berigan, Bud Freeman, Max Kaminsky, Fats Waller, Billy Butterfield, Bobby Hackett, Eddie Condon, and the bandleader Jess Stacy, the latter to whom Wiley was married for a number of years. These influential albums launched the concept of a "songbook" (often featuring lesser-known songs), which was later widely imitated by other singers. Wiley's career made a resurgence in 1950 with the much admired album Night in Manhattan. In 1954, she opened the very first Newport Jazz Festival accompanied by Bobby Hackett. Later in the decade she recorded two of her finest albums, West of the Moon (1956) and A Touch of the Blues (1957). 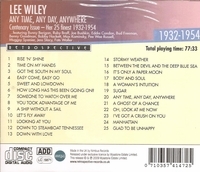 In the 1960s, Wiley essentially went into retirement, although a 1963 television film, Something About Lee Wiley, which told her life story, stimulated interest in the singer. Her last public appearance was a concert in Carnegie Hall in 1972 as part of the New York Jazz Festival, where she was enthusiastically received."